We held our Annual New Catalog Kickoff and Buy One, Get One Free Event at the Stamp Studio at the beginning of June. I thought I'd take a moment to show you some pics from this fun event :). 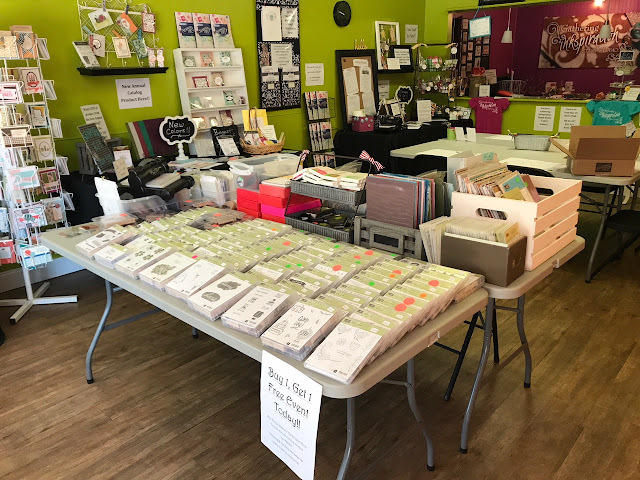 I had a display table featuring some of the products from our new 2018-19 Annual Catalog. There was a display showing each of our new Core Colors. 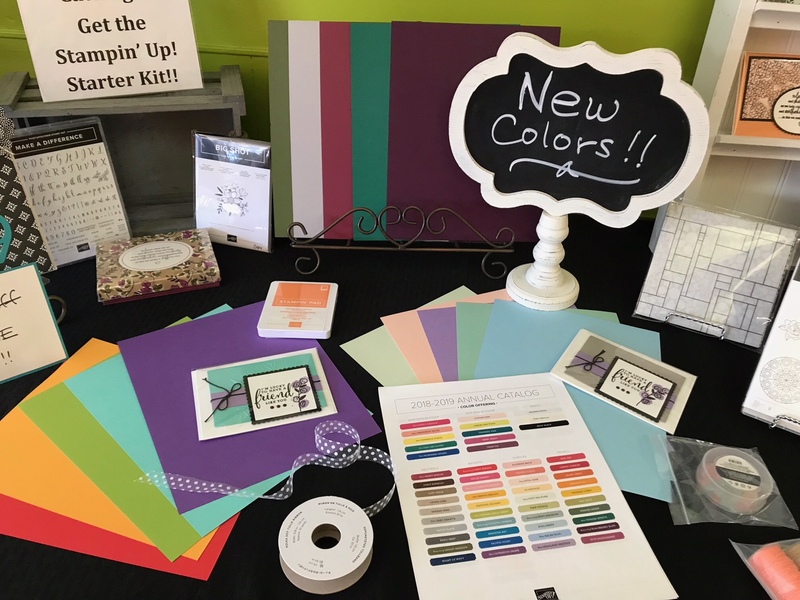 I am so excited to play with these new colors on LOTS of future projects! 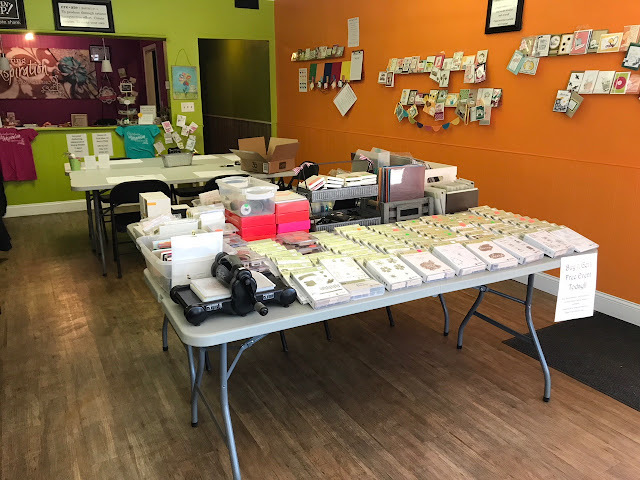 The biggest order of the BOGO Event took home an awesome basket of goodies - the new Detailed with Love Stamp Set, 2018-20 In Color Cardstock Pack, 2018-20 Ink Pads, a sample of the 2018-20 In Color Ribbon and 5 cards made with our new In Colors. 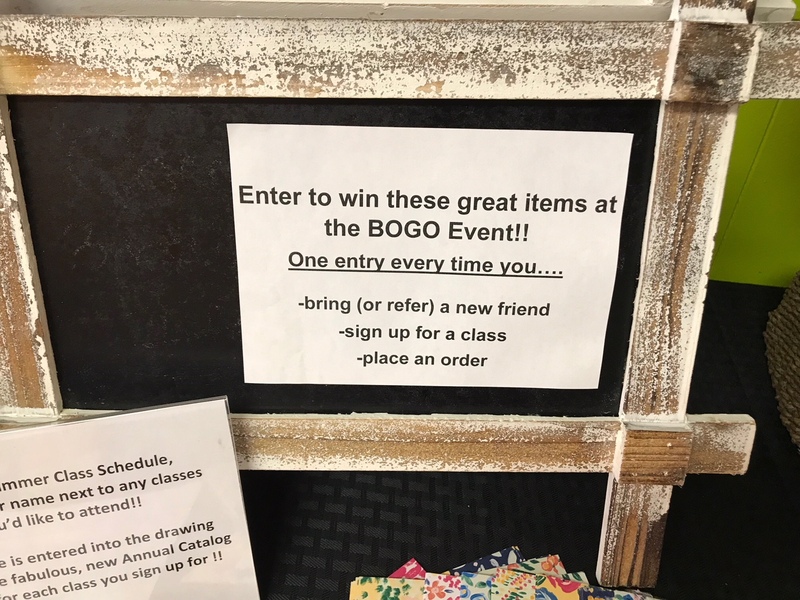 Congratulations to Karen Smith - she was the winner for her biggest order of the BOGO Event!! 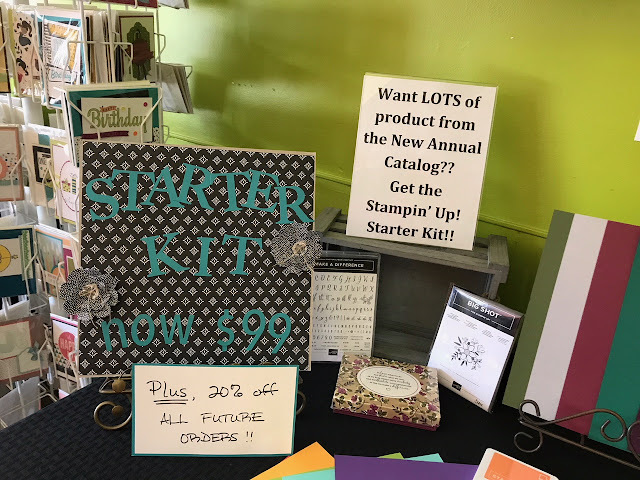 Of course, there was a display for the Starter Kit - in case anyone just had to have it all!! 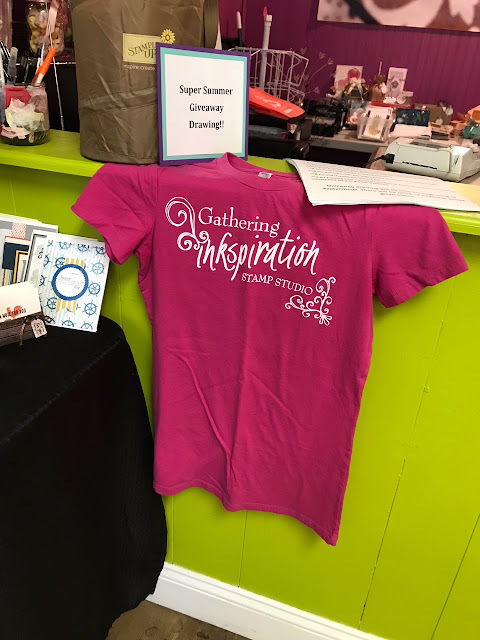 More details about purchasing the Starter Kit and becoming an Inkspired Stamper can be found here. The rack at the studio is now filled with our 2018-19 Annual Catalogs!! 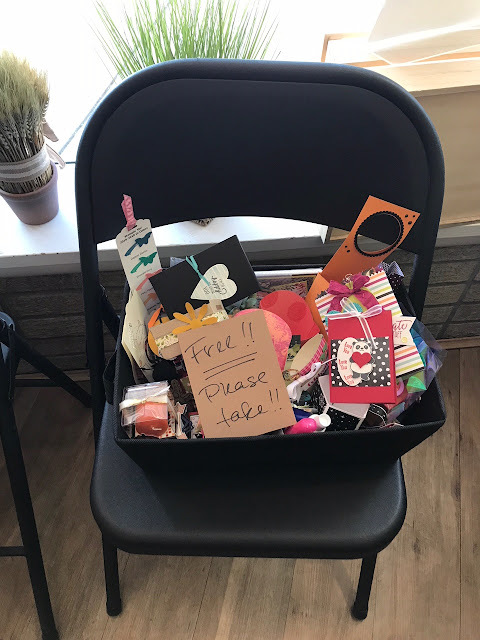 Stop in and pick one up anytime!! 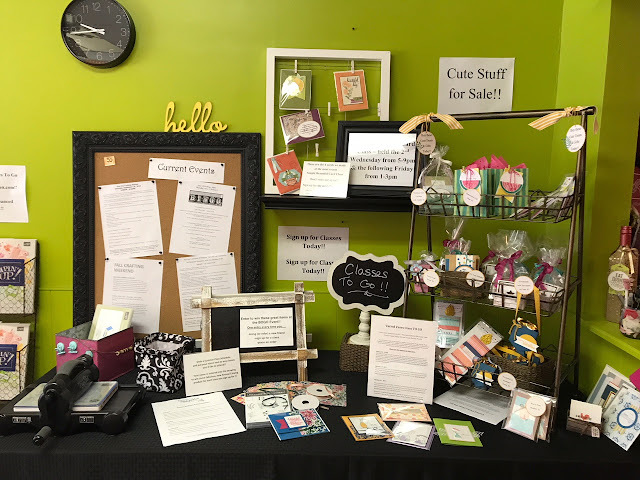 Here's a display about our Simple, Beautiful Card Class, Class To Go and some "Cute Stuff for Sale!!". 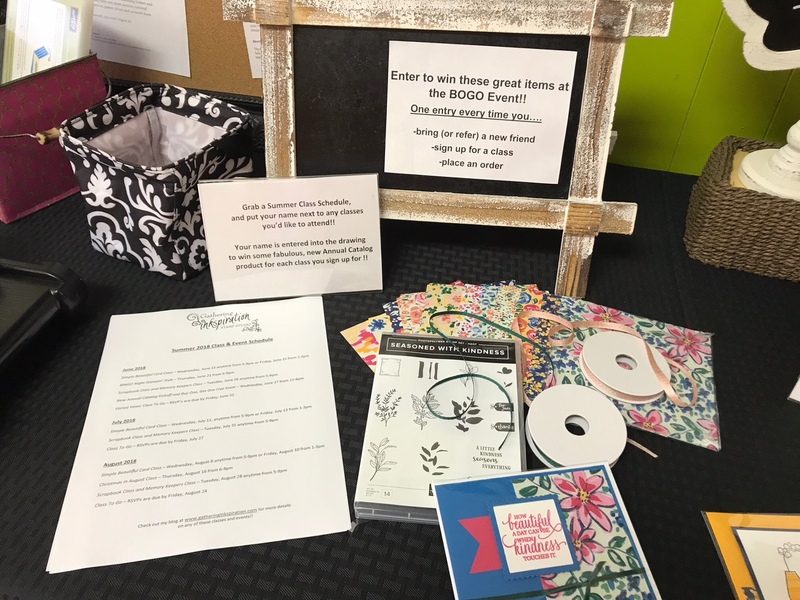 Your name was entered into the drawing for each of the items mentioned above. I had Summer Class Schedules on hand - anyone that signed up for a class or event that day got their name entered into the drawing (for EACH event they signed up for!). 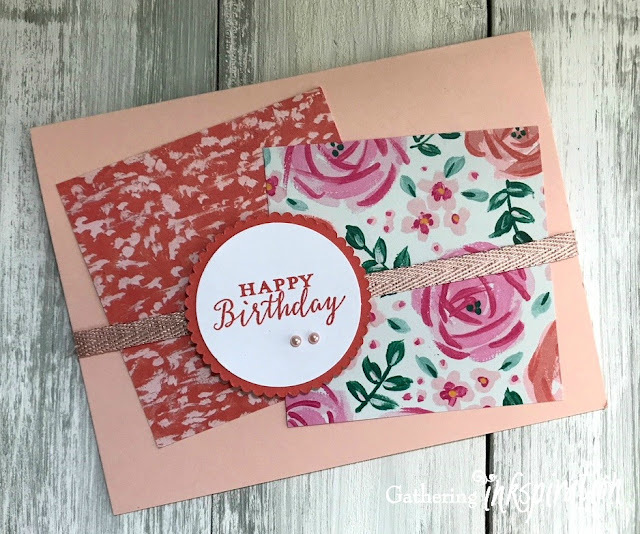 Here's a peak at the giveaway prize - the new Seasoned with Kindness Stamp Set, Garden Impression Designer Series Paper Pack, Metallic Ribbon Combo Pack and a fun card made with the DSP and ribbon in the giveaway! 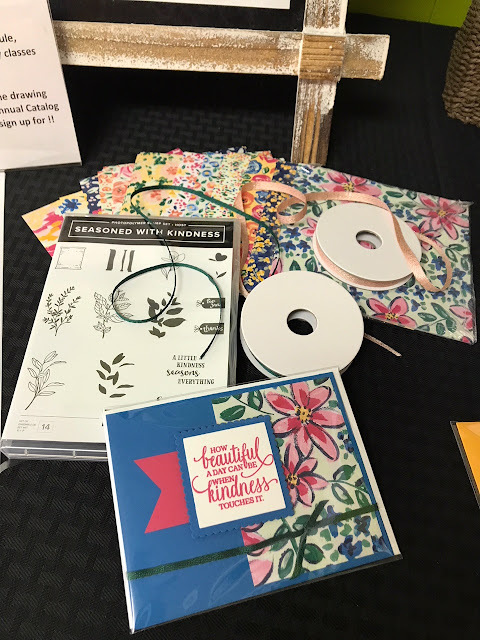 Congratulations to Bonnie Simon - her name was drawn for this giveaway prize :). Here's a peak at our latest Class To Go. You can get more details on the Varied Vases Class To Go Here. 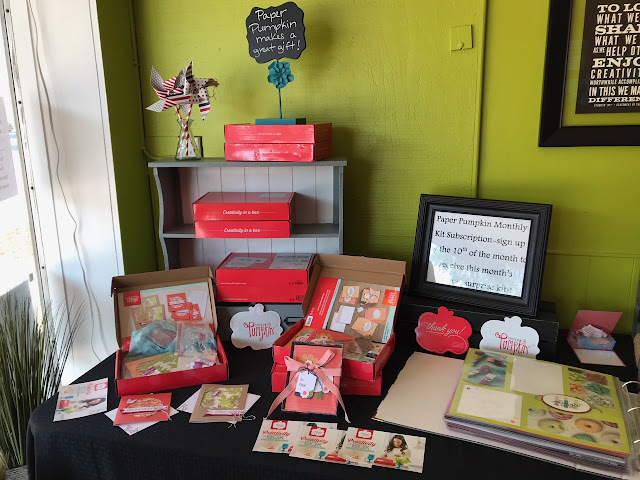 I had a chance to refresh some of the other display tables, too - here's a look at the Paper Pumpkin display. 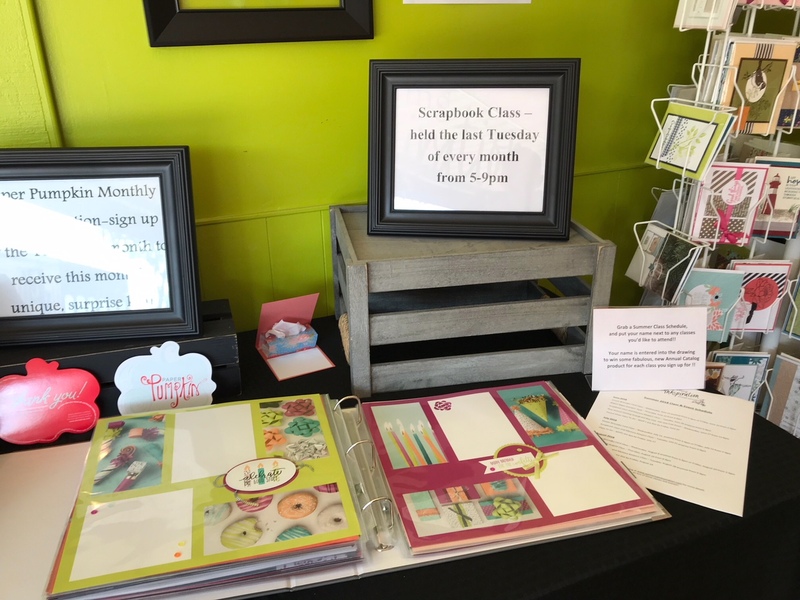 And... the Scrapbook Class display. 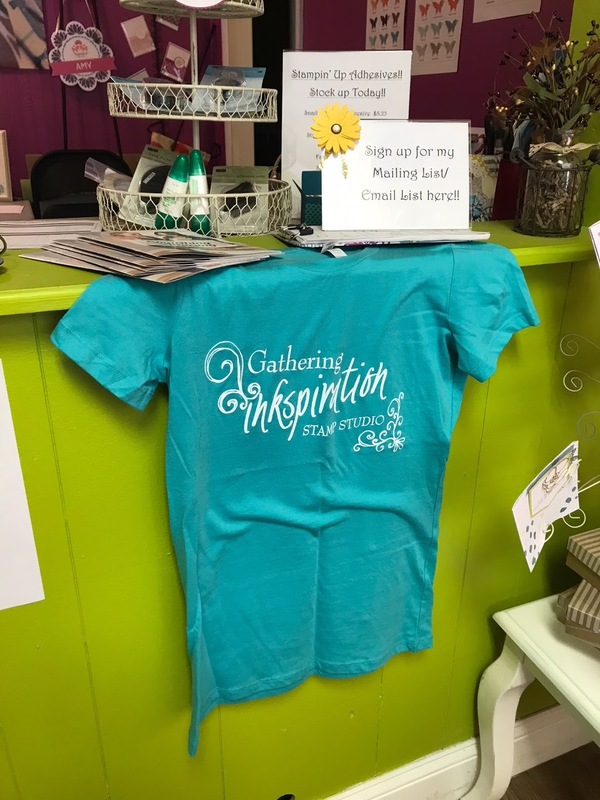 We now have Gathering Inkspiration Stamp Studio t-shirts for Sale for $20 each!! or Berry Pink. Sizes run from Small - XXXL. Just let me know which color and size you'd like! 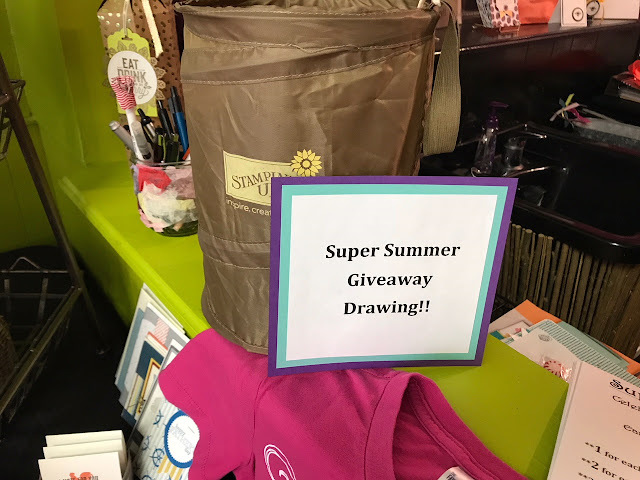 We also announced a fun, new promotion this summer called the Super Summer Giveaway!! 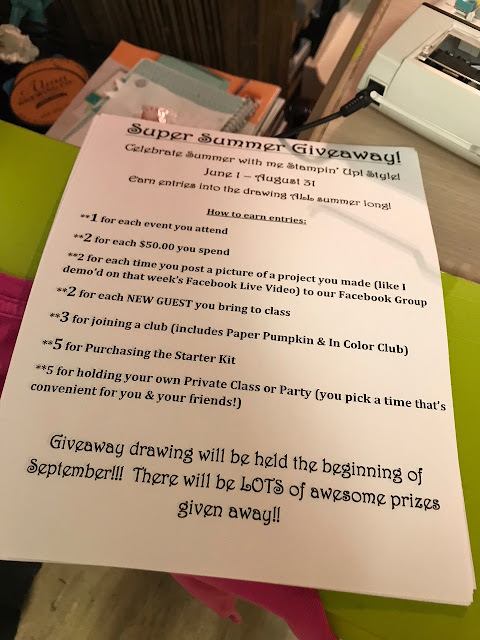 Here's how the Super Summer Giveaway will work!! 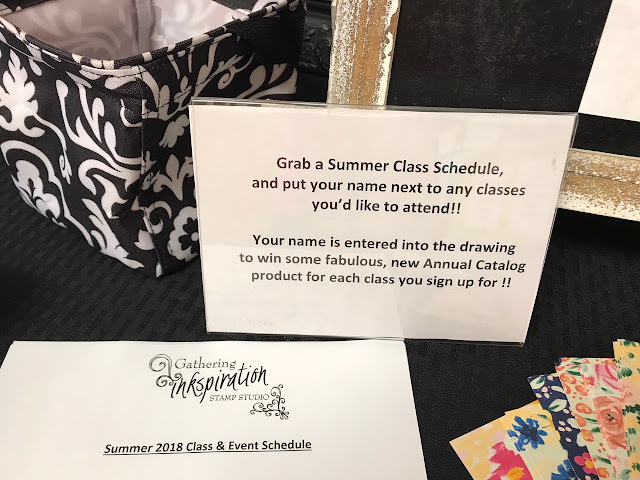 I can't wait to give LOTS of prizes away at the end of the summer :). 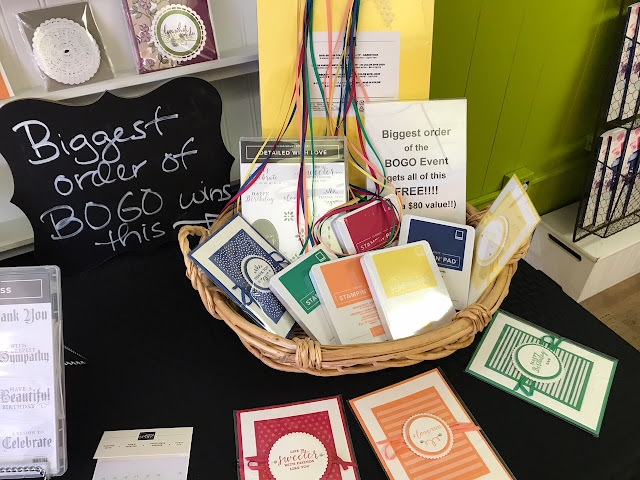 You can learn more about the Super Summer Giveaway here. Of course, we had to have a 2018-20 In Color display. We're doing an In Color Club again this year. 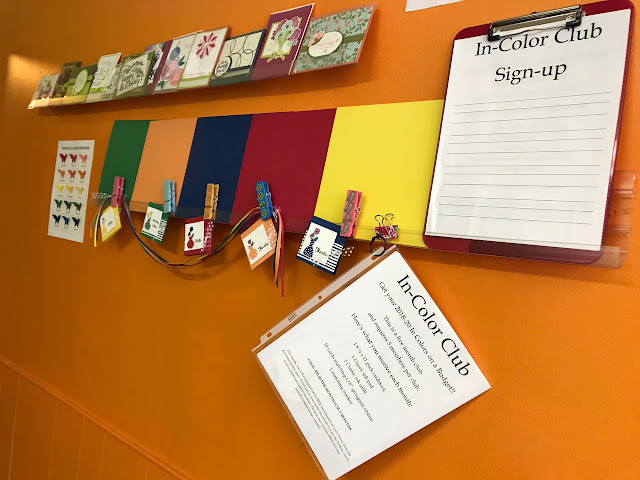 You can find all of the details on the In Color Club here. 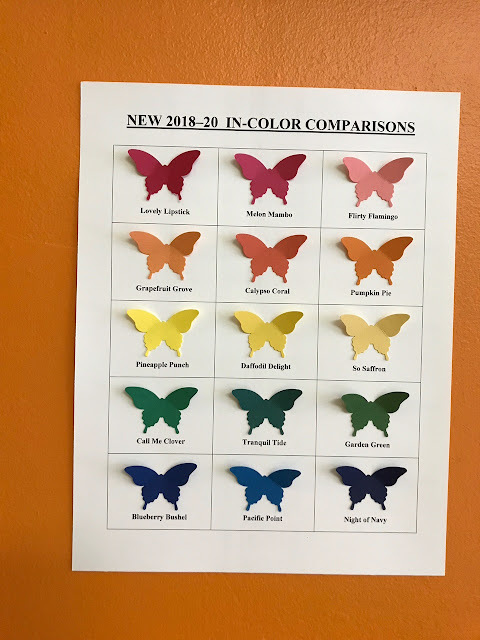 And.... here's a comparison of of our 2018-20 In Colors against some of our Core Colors. I cleaned out a bunch of displays and am giving some fun things away for FREE!!! 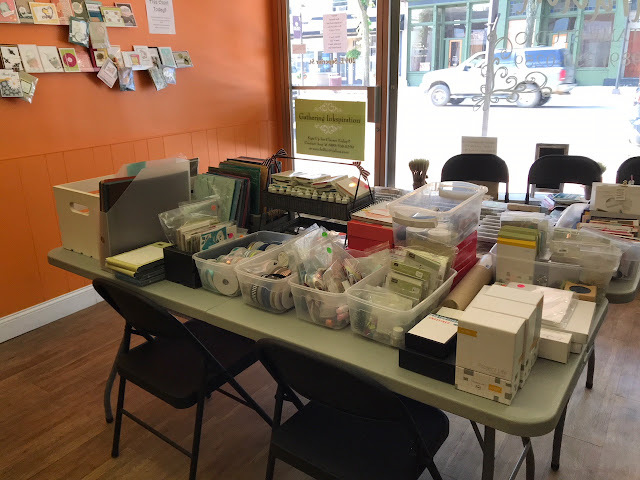 This is all of my retired product!!!!! 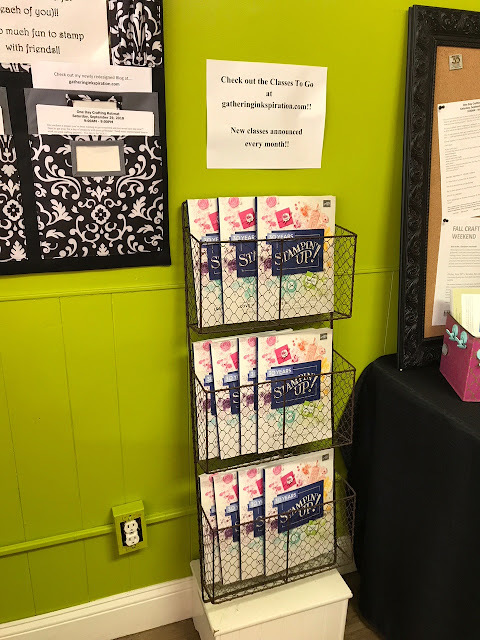 You shop from the retired product table and get new Annual Catalog product for FREE!!! This is such a great deal for everyone!! It helps me clean out my craft room to make way for the new product and customers get an awesome deal, too!! I can't believe I'm getting rid of all of that ribbon and those embellishments!!! I just love all of those things!! 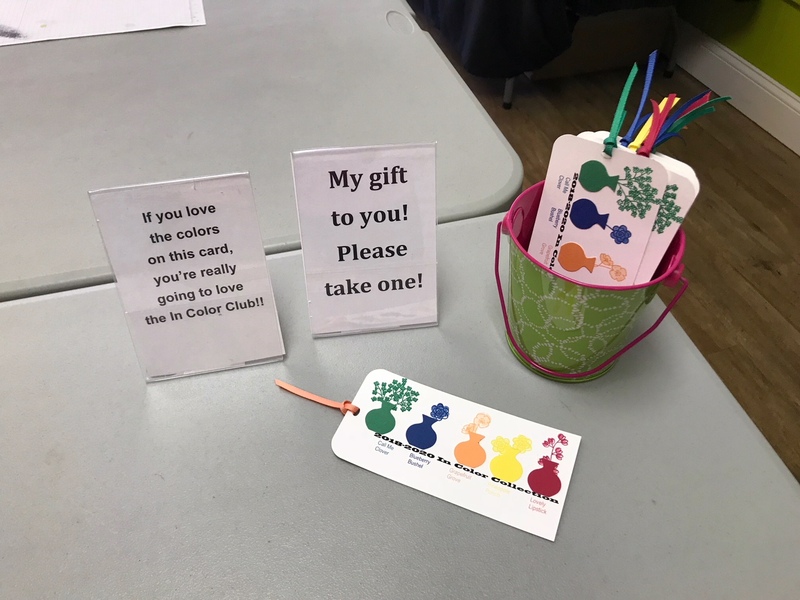 I made cute bookmarks for everyone (idea CASE'd from Brenda Quintana). 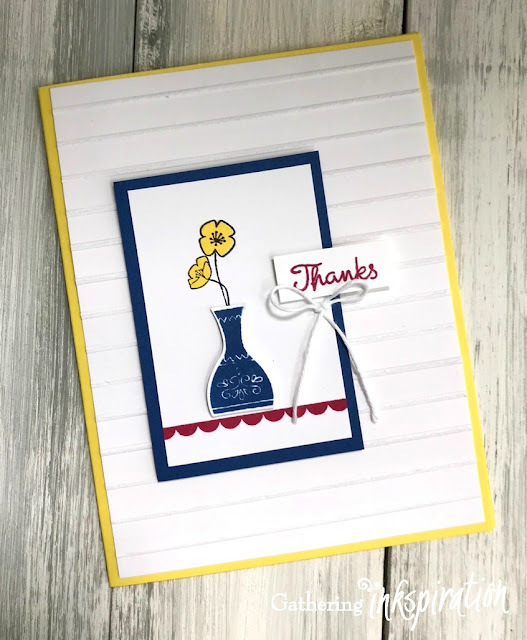 They feature each of our new In Colors, the Varied Vases Stamp Set and Vases Builder Punch. The first card featured 3 of our new In Colors (Pineapple Punch, Blueberry Bushel and Lovely Lipstick), along with the Varied Vases Stamp Set and Vases Builder Punch. The second make-n-take featured the gorgeous Garden Impressions Designer Series Paper, Metallic Ribbon Combo Pack, Artisan Pearls and our new core (Subtle) color, Petal Pink. 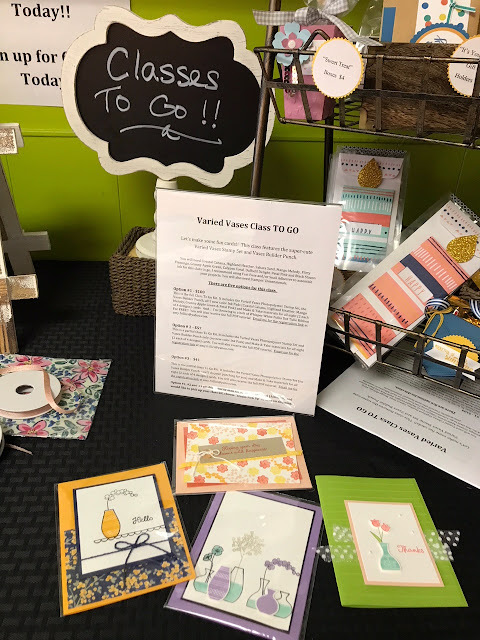 You can learn more about each of these cards on our Facebook Live Video here. If you're sad you couldn't attend this event, guess what?????? 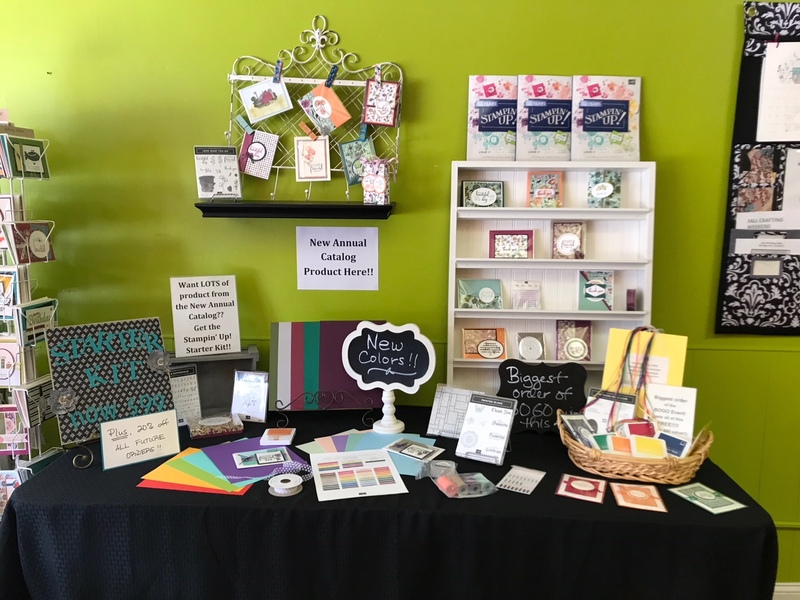 You can learn more about our new New Catalog Kickoff and BOGO Event here.